This year, we chose a female pig. For those who haven’t heard our pig story from last year, you may want to go check it out. Last year we had a male pig and that came with the duty to remove certain parts so he would grow into a nice, meat pig. However, this year came with a new set of operations…that of learning how to ring a pig’s nose so we could let her graze in the pasture without plowing it up. Like last year, I stayed in the house and pretended not to hear the screaming pig or see the boys bent over struggling with a pig who obviously didn’t find nose piercing a pleasant activity. They finally finished the deed and released her into the pasture. All is well, except our concern that maybe pigs like to eat baby lambs? We are still relatively new to farm life so we don’t know these things yet? We separated the sheep and the pig with an electric tape fence. 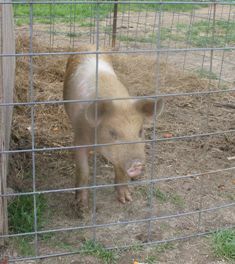 The pig, of course, tested the fenced area we wanted her in and kept going to the fenced area we did not want her in. After a while, we left her……and watched and hoped she didn’t eat lambs or try to hurt the sheep. We quickly observed she befriended the sheep and seems to think that she is part of the herd following the sheep where they graze and lounging where they lounge. It is sort of a strange site.